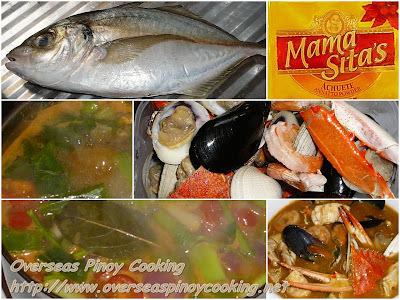 Seafood Bouillabaisse, Pinoy Style. I have been receiving several request of a bouillabaisse recipe for some time now. After managing to collect some ingredients I am finally cooking my version of bouillabaisse soup, I call it Seafood Bouillabaisse, Pinoy Style. I have to substitute ingredients that can be found on a most Pinoy kitchen. Cooking is fairly easy except for preparation of the soup base which could take anywhere from 45 minutes to more than an hour, it really depends on one preference if you have time then go ahead boil it a little longer. My version of bouillabaisse is made up of some mussels, clams, crabs, prawns and for the fish I used talakitok (trevally). I substituted the expensive saffron with annatto powder (Mama Sita Annato Powder in sachet, it is available in most Asian store. Okey here is the recipe of my version bouillabaisse soup. Fillet the trevally, cut the head and bones into manageable pieces and keep aside. Cut the fish fillet into serving pieces, keep aside. In a large sauce pan melt 2 tbsp. of butter, add in the garlic, onion and tomato and stir cook for 2 to 3 minutes. Add in the fish bones and continue to stir cook for 2 to 3 minutes. Add in the fish sauce, crushed pepper corns, bay leaf and tomato paste and stir cook for another 1 to 2 minutes. Add in 1 1/2 to 2 liters of broth from boiling the seafoods (add water if not sufficient), the spring onions, celery, parsley (reserved some for garnishing), lemon rind, bring to a boil and simmer at low to moderate heat for 45 minutes to 1 hour (add more water as necessary) then reduce the liquid to about half. Scope out any scum that rises. When done remove from heat, using a large sieve filter out and discard residue from the soup base. Return to the sauce pan and bring to a boil, add in the potato and annatto powder diluted in 1/4 cup of water. Simmer at moderate heat until the potato start to crumble. Add in the remaining butter, crabs, mussels, clams, prawns and fish and cook for about 1 to 2 minutes. Correct saltiness if required. Add in the cornstarch diluted in 1/4 cup of water and cook for another minute, garnish with the remaining parsley. Serve hot. Wow thats what you call seafood overload, I must try this out. I love seafood a lot! Yes this one is a winner, thanks.